Former Ute offensive coordinator Aaron Roderick is back at BYU. His first task as Cougars’ QB coach? Pick a starter. Provo • Aaron Roderick anxiously studied his phone, hoping to learn that his 9-year-old son found his assigned basketball court among the dozens temporarily created in a convention center in Sandy, 30 miles away. In August, Roderick will navigate the four contending quarterbacks through a similarly complicated search that comes with a deadline. One of them will take the field Sept. 1 at Arizona, beginning a pivotal season for BYU’s football program. It barely would be an exaggeration to say one (or more) of those quarterbacks will determine the entire direction of a season and the future of coach Kalani Sitake and his staff — including five new offensive assistants. The performance of the QB is more important than the choice of the QB, but that’s where the process starts. BYU will have 25 practices to pick a starter; Roderick is allowing himself much less time to decide, in consultation with Sitake and offensive coordinator Jeff Grimes. That means narrowing the competition to two quarterbacks even sooner. “We don’t have a lot of time to waste,” he said last week, during the school’s annual Football Media Day. 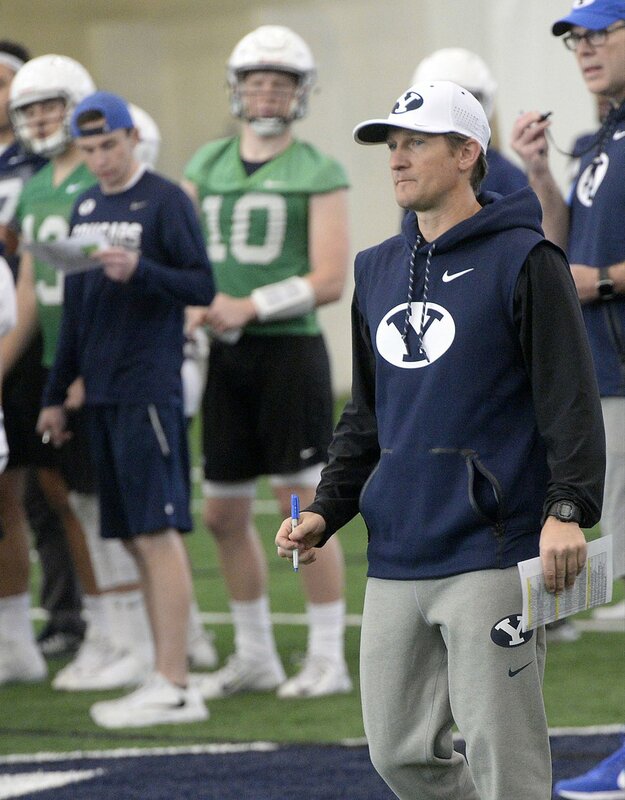 (Al Hartmann | The Salt Lake Tribune) BYU opened spring football camp on Monday March 5 in the indoor playing facility with some new offensive coaching staff, like quarterback coach Aaron Roderick. In that statement, Roderick shrewdly accounted for everybody — Tanner Mangum, Beau Hoge and Joe Critchlow started multiple games in 2017 and freshman Zach Wilson is a genuine contender. Roderick’s pressurized, deadline-driven responsibility comes after a 2017 season when he had plenty of time to do whatever he liked. His year away from the profession followed his 12 seasons at the University of Utah, where he was fired as offensive coordinator after a 9-4 season. He eventually joined Sitake’s staff, after having worked with him at Utah and Southern Utah. 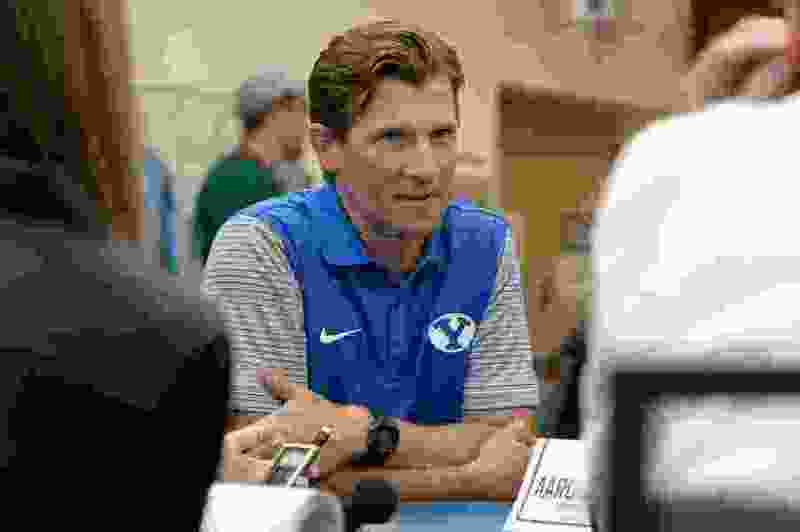 Roderick returned to BYU, where he was a receiver in the 1990s. He accepted a job with the Cougars in January 2013, when offensive coordinator Robert Anae was assembling a staff for his second stint in that position. Roderick soon went back to Utah as receivers coach. He’s in Provo to stay this time, assuming the Cougars improve from 4-9 in 2017. Roderick maximized his season out of work by spending more time with his daughter and son; that opportunity was “awesome,” he said. So were the weekends he spent watching football, without agonizing. Roderick, 45, immersed himself in offensive football. He studied Stanford, Washington, Northwestern, Memphis, Toledo and other programs that intrigued him, with a basic theme of analyzing coaches who do “something with less,” he said. The night he spent in Miami with former Ute co-worker Dennis Erickson, watching the Hurricanes beat Notre Dame and observing Erickson among his old Miami players also resonated with him. “Seeing the reverence his players had for him was really cool,” he said. Those guys clearly appreciate what Erickson did for them. Roderick hopes to have that kind of impact as his career resumes in the Cougars’ quarterback meeting room. He also realizes that in late August, one of those QBs may like him more than the others do.